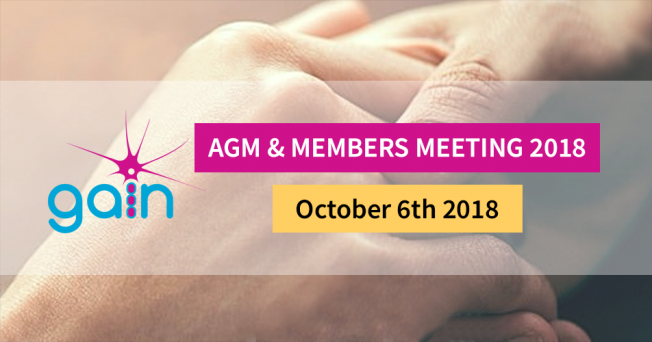 Details: The GAIN 2018 AGM and Members' Meeting will be held at the Catholic Church Hall, Jermyn Street, Sleaford, NG34 7RF on Saturday 6th October. Parking is available opposite the hall. Everyone is welcome to join us for the AGM will commence at 10.30am (arrivals and coffee from 10am) and will be immediately followed by a Members' Meeting, to include a review of the year and our plans for the future. Tea and coffee will be available, and lunch will be served after the meeting. Attendance for the AGM is free, but if you are staying for the Members' Meeting and lunch, there is a charge of £5 towards costs. Please register if you would like to join us by sending a cheque (payable to GAIN) for £5 along with your name, address and telephone number to GAIN, Woodholme House, Heckington Business Park, Station Road, Heckington, NG34 9JH.